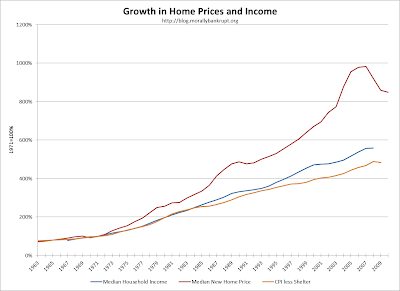 As you can see below, housing prices grew much more rapidly than income, and both outpaced inflation less shelter. 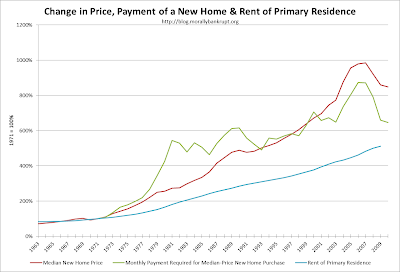 Even though home prices grew rapidly, falling interest rates meant that the monthly payment required to buy a home grew at a slower pace, although still at a faster pace than median household incomes and rents. During the same time, rent expenses grew at a slower pace than household incomes, and generally trended with CPI ex-shelter. If it wasn't for falling interest rates, home ownership would have not been possible for many over the last twenty years. The gap between the red and green lines is the effect interest rates had on the payment required, and it's there one can see how lower interest rates allowed prices to swell while incomes grew only marginally faster than the general price-level. I don't think it's a stretch to blame lower interest rates to the rise in home prices. I also think that housing prices would be lower if it wasn't for the extraordinary loose monetary environment we are currently in. 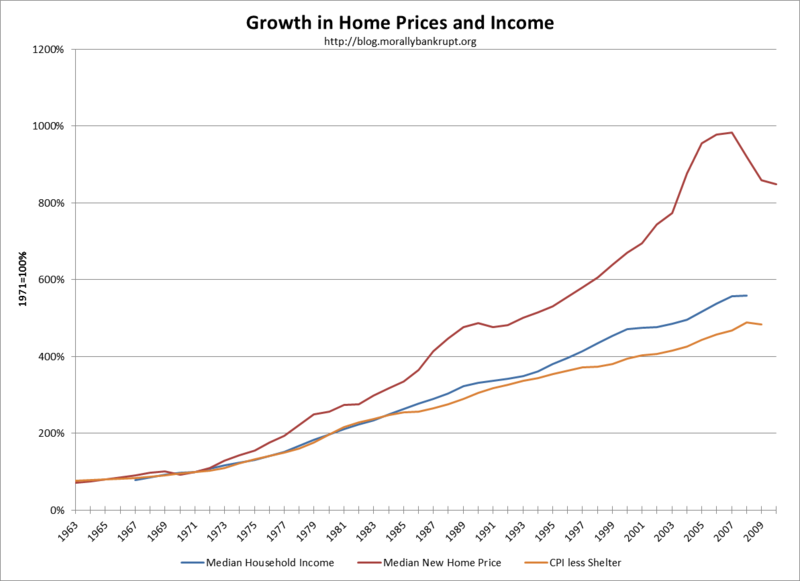 Additionally, I expect rising interest rates to be a real drag on future home price appreciation; however, if we do enter a long deflationary cycle, it could take many years to get to that point. In the next post, I will show how prices, required payments and borrowing capacity changed over time and I will discuss why I believe interest rates will remain low for an extended period of time; it will be the last data post. The post after that will include collection methods, sources and will include a link to the entire data-set in excel format for others to use. I can't narrow it down and compare equal types of housing--i.e. the homes represented in the median-price new home figure are newer and may be bigger or nicer than the ones represented by rent figures. A better measure would have been owner's equivalent rent, but because that number is based on how much an owner thinks they could rent their home for, and that doesn't necessarily represent real market conditions. BLS rent data includes an age adjustment and may include a hedonic adjustment. These would need to be stripped out for a fair comparison to new home prices. Because payments toward ownership are amortizing--i.e. 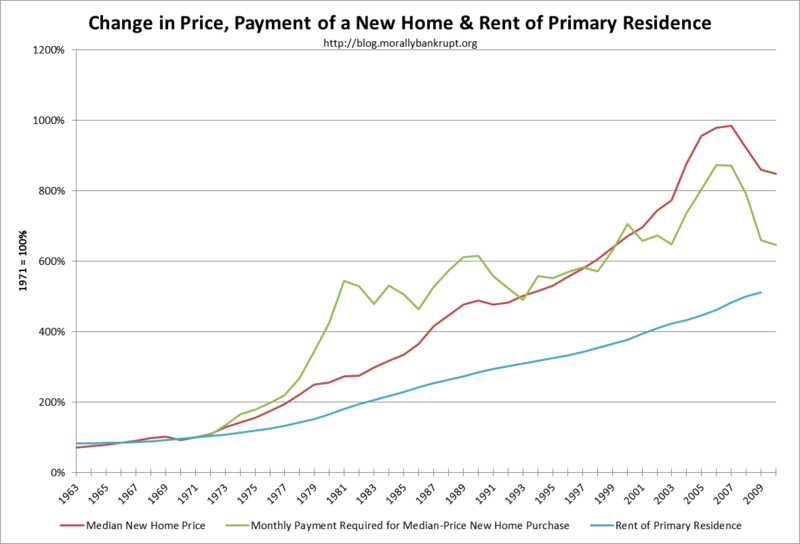 they build equity--, rents and required payments cannot be directly compared. Protecting yourself to maintain your position might be a good move.